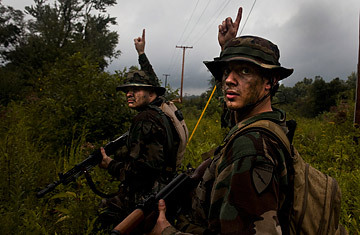 ODF militiamen Frank Delollis, right, signals for a patrol party to turn around while searching the Old Roseville Prison property in Roseville, Ohio for enemy combatants during the Ohio Defense Force's annual FTX on Aug. 21, 2010. One answer comes from former Alabama militia leader Mike Vanderboegh, who wrote an essay that is among the most widely republished on antigovernment extremist sites today. In "What Good Is a Handgun Against an Army?" Vanderboegh says the tactical question is easy: Kill the enemy one soldier at a time. A patriot needs only a "cheap little pistol and the guts to use it," he writes, to shoot a soldier in the head and take his rifle; with a friend, such a man will soon have "a truck full of arms and ammunition." Vanderboegh is hardly a man of action himself, living these days on government disability checks. Even so, when he wrote a blog post in March urging followers to protest the health care bill by breaking windows at Democratic Party offices, they did so across the country. Another answer comes from Richard Mack, who is holding constitutional seminars for county sheriffs from coast to coast, urging them to resist what he describes as federal tyranny by force. In his presentations, he shows movie clips to illustrate his point, like a scene from The Patriot in which Mel Gibson says, with fire in his eyes, "You will obey my command, or I will have you shot." Citing a long list of antecedents, beginning in 11th century England, Mack asserts that each of the nation's county sheriffs is the supreme constitutional authority in his or her jurisdiction. A sheriff has the power to arrest and, if necessary, use lethal force against federal officers who come uninvited, and he may "call out the militia to support his efforts to keep the peace in the county." In his term as sheriff of Graham County, Ariz., Mack became famous for fighting and winning a legal battle against a provision of the Brady Bill that required him to enforce federal gun-control laws. He now says he wishes he had stayed out of court and simply drawn a line in the sand with the ATF. "I pray for the day when the first county sheriff has the guts to arrest the real enemy," he says. Among the enemy, he numbers "America's gestapo," the IRS. Steve Kendley, a Lake County, Mont., deputy sheriff who is running for the top office there on Mack's platform, says he expects federal agents to back off when threatened with arrest, but he is prepared for "a violent conflict" if "they are doing something I believe is unconstitutional." The nearest antecedent to Mack's argument, and the only one known to scholars interviewed for this story, is the Blue Book of the Posse Comitatus, by white-supremacist militia leader Henry Lamont Beach, whose organization disintegrated after leading members were convicted of felonies or killed in 1983 during shoot-outs in Arkansas and North Dakota with federal marshals and uncooperative sheriffs. Beach used nearly identical language, saying the county is "the highest authority of government in our Republic" and the sheriff "the only legal law-enforcement office." After Time e-mailed Mack extracts of Beach's book, he replied that it "sounds exactly like Jefferson." Federal law-enforcement agencies want no part of a conversation about angry antigovernment extremists and refused in virtually every case to speak on the record. A few injudicious passages from career analysts at the DHS in an April 2009 report titled "Rightwing Extremism"  which could be misread to suggest danger from ordinary antigovernment opinions or military veterans in generalbrought a ferocious backlash. DHS Secretary Janet Napolitano distanced herself from the report and forbade further public discussion of the subject. Shortly afterward, the National Security Council staff canceled plans for a working-group meeting on the surge of violent threats against members of Congress. Yet the months that followed brought fresh support for the study's central finding, that rising "rightwing radicalization and recruitment" raised the risk that lone wolves would emerge from within the groups to commit "violent acts targeting government facilities, law-enforcement officers, banks and infrastructure sectors." Within 90 days came the Von Brunn shooting; a triple murder of police officers in Pittsburgh by white supremacist Richard Andrew Poplawski; and a double murder of sheriff's deputies in Florida by a National Guardsman, Joshua Cartwright, who attributed his rage to Obama's election. A top FBI counterterrorism official says the bureau's "biggest concern" is "the individual who has done the training, has the capability but is disenchanted with the group's actionor in many cases, inactionand decides he's going to act alone." A high-ranking DHS official added that "it's almost impossible to find that needle in a haystack," even if the FBI has an informant in the group. James Cavanaugh, who recently retired from a senior post at the ATF and took part in some of the bloodiest confrontations with the radical right in the 1990s, says the creation of monsters in their midst is the greatest danger posed by organized groups. The ceaseless talk of federal aggressionand regular training to repel it"becomes a hysteria where you constantly, constantly practice and nothing happens," he says. "Now most of them wouldn't go out offensively, O.K.? But generally why they're dangerous is that some people can't stand that rhetoric and just wait for it to happen. And they go off the rails, á la McVeigh."